Upon the invitation of U.S. Congresswoman Anna G. Eshoo (D-Palo Alto), Sacred Heart Preparatory’s visual arts students decorated the Congresswoman’s Christmas tree currently on display in her Washington, D.C. office. 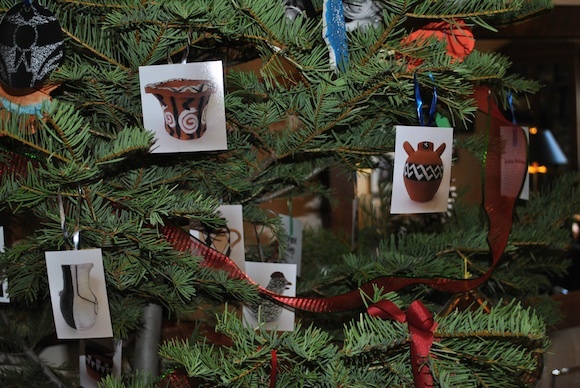 The theme of the tree, “A Snapshot of SHP Art,” features handmade miniature ornaments of various students’ artworks from this past fall’s classes, including images of pueblo pottery, abstract photography, Duchesne watercolor leaves, and pastel details of impressionist paintings. “I can’t thank the students enough for the fabulous handmade ornaments they made and sent to me for our Washington, D.C. Christmas tree! The decorations are wonderful ‘snapshots’ of the creativity and talent of the students, and everyone who comes into the office comments on them,” remarked Eshoo.